Best Practice is a goal, a process and an outcome – the result of a long journey of many parts. It implies, and helps to deliver, success. In an ordinary business the key measures of success are essentially commercial (eg: profits) and, being objective, they’re easily quantified. In a family business, success is a combination of qualitative and quantitative measures (eg: peace and prosperity over time). This creates extra complexity and makes success both more elusive and harder to quantify. The path requires: “Harmonising the Family” and “Professionalising the Business”. The outcomes include: good risk management; long term business profitability and viability; family wealth protection and enhancement; strong, loving and harmonious family culture; reliable increases in family capital: human, financial and commercial. Business Family Nirvana is having: “a happy family AND a strong, sustainable business”. High trust cultures encourage everyone to help everyone else to be happy and to do a great job – so family and business goals are consistently achieved, or exceeded. Such cultures are the holy grails of every genuine family and business leader and, just like the grail legend, the rewards only come after long and hard travails – they don’t just happen by chance, charity or neglect. 7 essential elements need to be present and working well, in whatever form is appropriate for the particular family and its business interests. We call them: The 7 Elements of Family Business Success. The bad news is that they cannot simply be bought as an off the shelf solution. The good news is that we can help you to introduce them into your family and your business relatively painlessly through a powerfully collaborative, best practice process. Relates to: Values, Visions, Missions and Goals (for family and business). Relates to: Strategy and Operational Plans (business). Relates to: Family and Action Plans (family). Relates to: personal, family and business performance obligations. These are the formal written plans made by the family and the business to help them achieve their visions and goals, in accordance with their values. They provide clear focus and direction; determine required resources and timing; facilitate the monitoring of performance and the measurement of results and generally provide an objective framework for motivating and managing both the family and the business. Comprises (for Business): Strategy Plan; Business Plan – Operations (includes revenue targets, budgets and cashflows); Marketing, Capex and HR Plans; Business Continuity and Succession Plans. Comprises (for Family): Family Plan; Stewardship Plan; Succession Plan. These are physical items you can poke a stick at (should you so wish). They are designed to put substance, formality and discipline (ie: backbone) into the dealings of both the family and the business. Structures are an essential component in professionalising the operations of both the family and the business. Structures fall into two major categories: (1) formal bodies that do things and (2) documents that reflect things that have been agreed. They’re implemented and enforced by those formal bodies. Business Bodies: Board of Directors, Advisory Board, Senior Executive Team; Executive Management Team (and supporting organisational structure). Business Documents: Codes of Conduct, Organisational Structure and HR Plan (job descriptions, KPIs etc. ); Employment Contracts; Shareholder and Buy/Sell Agreements. Family Bodies: Family Council; Advisory Board; Family Office; Family Forum. Family Documents: Family Constitution; Code of Conduct; Charter of Mutual Obligations; Pre and Post-nuptial Agreements (Binding Financial Agreements); Wills, Letter of Wishes; Estate Plans; Powers of Attorney (financial, legal, medical and guardianship). Systems describe how things should be done, in both the family and the business, to maximise certainty, consistency and efficiency. They should be based on practical process designs and personal / organisational commitments to do things in agreed ways. Good systems are fundamental requirements of long term success and sustainability in both families and businesses. It often happens that the way things should be done is not the same as what is actually done, in both the family and the business. This is where reality bites and there may be a serious disconnect between the culture of the family or the business (“the way we do things around here”) and the idealised notion of what’s going on. Comprises: Written policies and procedures and the actual doing of prescribed actions. All the strategising, structuring and systematising in the world won’t amount to a row of beans if the people who need to make things work don’t have the skills, and/or the confidence to use their skills, to discharge their responsibilities. Many family business people, and their businesses, punch far above their natural weight in their chosen markets. This is often attributed to their pride and passion for the business; their closeness to their markets, to their dogged determination to succeed, or to their terror of failing. Eventually these guys find themselves exposed and vulnerable – victims of their own success – because the style and skills that helped them to establish and grow the business aren’t adequate or appropriate for maintaining its current status, and are even less suitable for supporting continued upward progress in challenging markets. Similarly, as each family matures, grows and spreads it needs to keep improving its style and skills in a whole host of areas that are affected by changing family demands and underlying family dynamics. Business skills requirements: strategic thinking and visioning; leadership and management; marketing; team building; communication, facilitation and negotiation; problem solving and decision making; planning and forecasting; system development and continuous improvement; quality control; effective meetings; time management; modern HR management; coaching and mentoring; relationship and conflict management. Family skills requirements: strategic thinking and visioning; leadership and team building; communication, facilitation and negotiation; problem solving and decision making; family planning; next generation education, coaching and mentoring; effective meetings; time management; relationship and conflict management. Family Business diversity and informality encourage Best Practice to be achieved through tools rather than rules. So we approach Best Practice through a process model comprising (notionally) sequential stages, with the results of each prior stage influencing the approach taken in the subsequent stage. The 7 Elements of Family Business Success describes the headline components of family business best practice. Over many years we developed and refined our own Process Model to help guide and manage the introduction of these components – in the right way; at the right time. 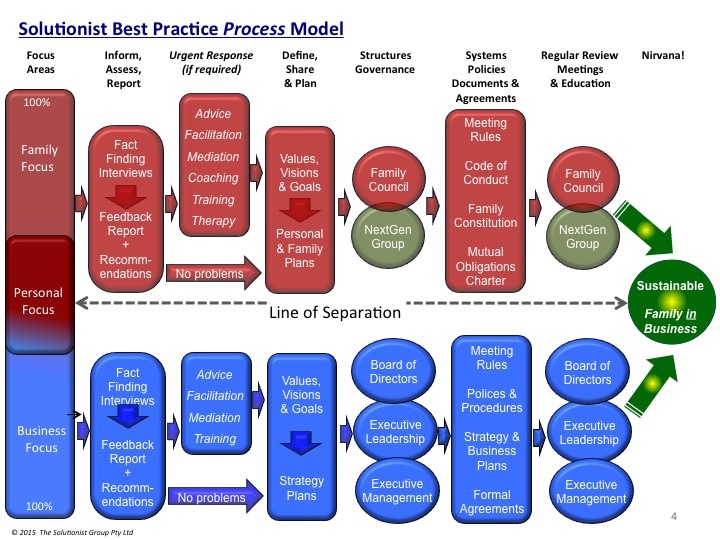 Our Model also provides a checklist of the many things that should be implemented on the road to best practice. The entire journey, for both the family and the business, is shown below. Each business family chooses its own journey, according to its current and foreseeable needs and circumstances. For some the focus is squarely on family issues, for others it’s on the business; for most, over the long term, it’s a combination of both. The process is sequential, with each stage building on what came before. It can proceed as narrowly or as broadly as the family wishes (subject to urgent needs and practicality); and as fast or slow as the family wants. It can go some or all of the way to Family Business Nirvana, depending on the family’s needs and stamina. Many families derive relief from simply starting the journey: just getting shape, focus and commitment into “doing something” feels great to the family that feels it’s been spinning its wheels for too long and desperately wants to feel a greater sense of positive purpose and forward movement. Most families start the process, get a taste for how well it works and whether it suits them, and then decide how far and fast they want to go. Of course, things can change (and usually do) once we get started. Flexibility is the name of this game. For the “average” business family, with a “normal” range of challenges in their family and their business, the entire process of professionalising the business and harmonising the family (getting everything in place and working well) takes between one to two years. Most families find that the value of the exercise far outweighs the costs – turning the time, effort and money spent into an investment, rather than an expense. Of course, their measurements take place on many levels, and each family applies a different set of objective/subjective criteria, so relative success can be hard to measure. 1. Starting Point (Focus Areas): family and business issues are tripping over each other in the Confusion Zone, causing business inefficiency and family tension. 2. Separation: separate the family from the business for all major decisions and actions, for the duration of the process. (At all times our antennae are tuned into the likely impacts of any decision or action, across both entities). 3. Factfinding: identify all relevant facts, opinions, objectives, issues and problems, for either or both of the family and the business. Gather all available and relevant “human” information regarding individuals, and their issues and influences. 4. Urgent Issue Resolution: resolve any serious problems that emerge during the fact finding stage before continuing, to avoid the risk they’ll derail the process. 5. Values, Visions and Goals (Clarity): launch into the best practice process by ensuring that everyone shares the same fundamental values (“personal drivers”) and that they agree on what they’re ultimately working towards: individually, for the family and/or for the business. 6. Business Strategy and Family Plans (1): pull the initial, agreed, big picture intentions for the family and the business down from the clouds and into written form. 7. 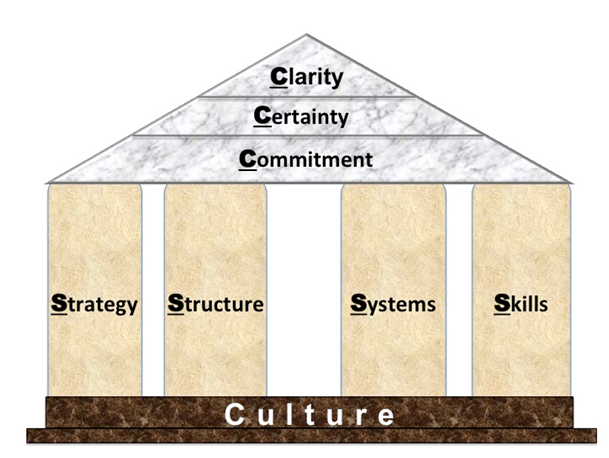 Structures (1): after gaining conceptual clarity and agreement over big picture goals and plans, establish the key Structures (formal governance bodies with appropriate decision making authority and capacity) required to develop and implement the coming plans, for both the family and the business. 8. Business Strategy and Family Plans (2): this is our serious planning stage, where we turn the values, visions, goals and big picture plans of both the family and the business into workable, detailed plans – right down to the level of allocated tasks, specific responsibilities and accountabilities, defined timings and necessary resources. The planning process is part of the Strategy phase. The completed documents become documentary “Structures”. 9. Structures (2): The Strategy stage usually identifies the need for a number of additional formal documents and agreements, for both the family and the business. This is where the lawyers and accountants become useful. Their work supports the plans and helps to achieve best practice by addressing technical, procedural and asset protection issues. Their work needs to accurately reflect family and business intentions – documenting agreements when everyone is cool and calm and willing to manage their assets to provide protection, without losing too much flexibility. 10. Planning (3): Now we’ve squared away most of the big picture stuff, we can seriously address other issues such as: performance expectations, succession, wealth management and asset protection. 11. Systems and Skills: We need to keep both of these squarely in our sights throughout the journey. They cover the way things are actually being done, especially by family members and key executives, benchmarked against agreed best practice expectations and criteria. We monitor progress and results throughout the process to check that everything is proceeding according to plan, and to identify the need for modifications on the way through. We’ve now done most of the hard work and are getting close to being in review, maintenance and renewal mode. Our systems and skills should now be working in “unconsciously competent” mode. 12. Commitment and Sustainability: Both the family and the business are dynamic entities whose fortunes and plans will vary from one year to the next. Provided everything’s in place and working to plan, it should become much easier to sustain momentum, stability and growth, in both the family and the business. You’re probably now about as close as you’ll ever be to Family Business Nirvana!